Every business wants to squeeze the highest level of productivity from its vehicles and many van fleets now operate fully-equipped mobile toolboxes, ready to work whenever and wherever. For those that require mobile power there is, however, one component that is often under-utilised – the engine. Winton Engineering has more than 30 years’ experience producing and fitting on-board power systems and last year the business was acquired by its long-standing partner Mattei, which supplies the compressors used in Winton systems. By installing a Driveline Power Take Off system any van can be transformed into a mobile compressor, generator, hydraulic pump or even a small fire engine. Jones believes the market has room to grow now Euro 6 and driver licence changes have made it tougher and more compliated to operate commercial vehicles above 3.5 tonnes. “As we all get older there are fewer people who will have the right licence to drive a vehicle up to 7.5 tonnes, most people are now limited to 3.5-tonne vehicles. That’s a problem for the industry,” he says. “Unless you take the test for 7.5-tonne vehicles then you can’t drive anything bigger, that’s why there’s such a push for 3.5-tonne vans in the market. Using smaller vehicles also has the benefit of lower capital costs, lower running costs and lower fuel costs. A Driveline Power Take-Off system connects to the prop-shaft of a rear-wheel drive vehicle or directly to the engine of a front-wheel drive vehicle. It uses the engine when the vehicle is stationary to drive a generator or compressor, which can then power a range of different tools. It means the vehicle is always ready to work, the driver only needs to keep fuel in the van’s main tank and operation is very simple. One of the key challenges for Winton was dealing with Euro 6 compliance. Initially vehicle manufacturers said aftermarket power systems couldn’t be fitted because the conversion involves modifying the exhaust. Jones explains: “The industry believed that you couldn’t modify the exhaust. It would have been a game changer if that was the case because if we couldn’t move the exhaust we couldn’t have done it. “We did a lot of research, did some testing at Millbrook then presented the results – which were good. Since then we have gone on to work with manufacturers like Mercedes-Benz and our customers, to make sure that we’ve got something tangible that works for them. The company had around 150 Euro 6 vehicles to convert in the last quarter of 2016. “No one else would have been able to do that. Because we pre-empted the shift we were able to get that early factory acceptance,” says Jones. 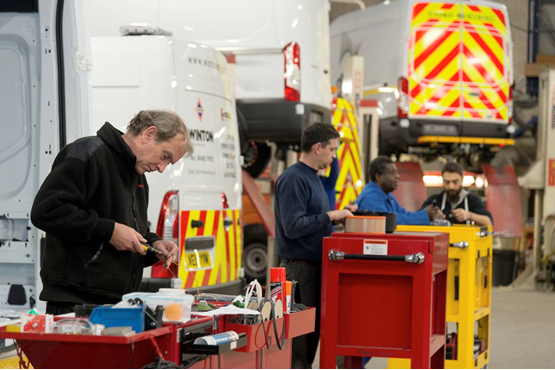 Manufacturer support is vital for Winton and it works tirelessly to ensure its products don’t affect the warranty or reliability of a van. They are approved by all the major manufacturers and are available to order through Vauxhall directly for the Movano. Weight was also a consideration for Winton, as many Euro 6 vans tip the scales at around 50kg more than Euro 5 models. As payload is a key criterion for buyers, that crucial weight penalty meant the company had to reduce the weight of its components from 231kg to 162kg. “In the markets we work in where people are taking the vehicle to do a job of work, downsizing isn’t an option. They have to be more self-sufficient; they have to have things like handwashing facilities and specialist tooling, which is making it harder to operate a 3.5-tonne van,” says Jones. “With lots of the big fleets, the drivers work home-to-site; lots of the operating depots have gone now. With a 3.5-tonne van they can take it home – you’ve got to be able to park it as well. The system that Winton builds is modular. It can provide a range of power sources based off the vehicle including pneumatic, hydraulic, electric and high pressure water, or a combination of those, in whatever format the end-user wants to suit their purpose. Jones explains: “We look at what a customer wants to do with their van and what their operation is, not just what they want to fit to the vehicle to do the job, but what they are going to do with the lifecycle of that vehicle. “It means they can go to work at night to dig a hole or weld something and have site lighting, water pumps and other ancillaries all from the one vehicle source. “It’s about sweating the asset. Instead of taking two vehicles to a job you can take just one. That’s the big advantage of our product. “Historically you would need to tow a compressor or have one mounted in the back of the van making all sorts of noises and smells. Ours is tucked within the chassis so the load space is unchanged, leaving room for tools or parts. The biggest market for this type of product is utility and civil engineering companies but as fleets look to reduce downtime, mobile service vans and tyre fitters are using the technology as well. Winton was chosen by Volkswagen Commercial Vehicles to provide the tooling for its new fleet of mobile service vans. The vans have been designed specifically for the needs of fleet customers with the capability to carry out service work, inspections, air-conditioner servicing, MOT repairs, minor warranty work and software updates, in any location. Andy Jones says: “For Volkswagen it’s an exciting new venture. It’s a complete mobile workshop and they can do pretty much anything with those vans that they can in a garage. The initiative is part of Volkswagen Commercial Vehicles’s ‘Working With You’ promise, which is designed to reduce downtime for its customers.